Egyptian rulers have been sailing during the Early Bronze Age (ca. 3300-2100 BC), i.a. Pharaoh Khufu-Cheops’ port at Wadi el-Jarf importing stones from the Sinaï (ca. 2550 BC), Sneferu (ca. 2575 BC) and Sahure (ca. 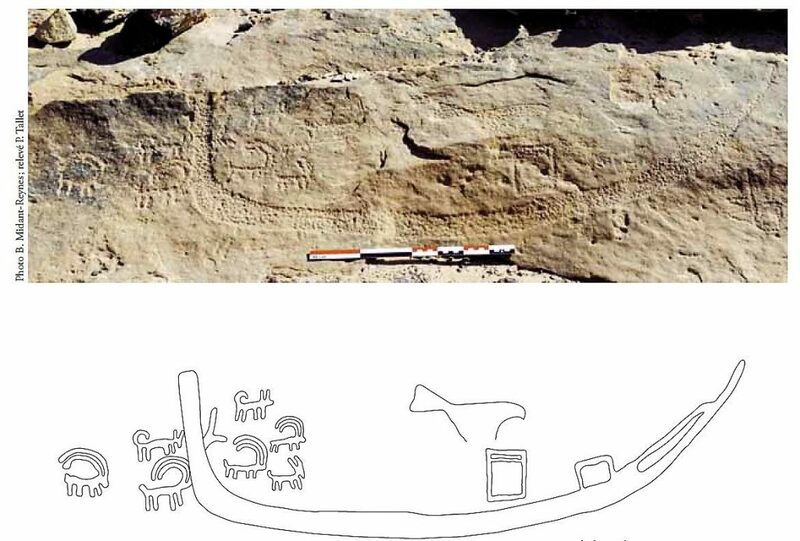 2450 BC) sending ships to Byblos for wood and to Puntland for exotic goods. 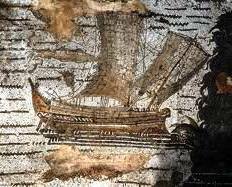 One of the oldest pictures of a ship (Egyptian Protodynastic, 3200 BC acc. to P. Tallet, 2012). Other examples are shown on vases of the same Gerzean period (e.g. British Museum N° 35324, 35502 & 36326) and on the handle of the so-called Gebel el-Arak knife. 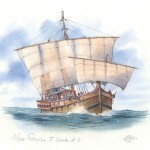 Minoans from Crete were probably the first “professional” merchant seafarers sailing internationally. This spanned, in round figures, the period between 2000 BC and 1500 BC. Egyptians developed river and sea ships for 2000 years during the 3rd and 2nd millennia BC. Around 1450 BC, Queen Hatshepsut sent a fleet on the Red Sea from Quseir to the Land of Punt to bring back exotic goods. This was even possibly achieved 500 years earlier from Marsa Gawasis. Hatshepsut’s fleet sailing back from Puntland (ca. 1450 BC), relief found in Deir el-Bahari temple. Later on, Ramesses II won a famous battle against the Sea Peoples ca. 1278 BC and provided shipbuilding assistance to the Hittites in ca. 1259 BC (Tablet KUB III 82 found at Boghazkoy/Hattusa ). 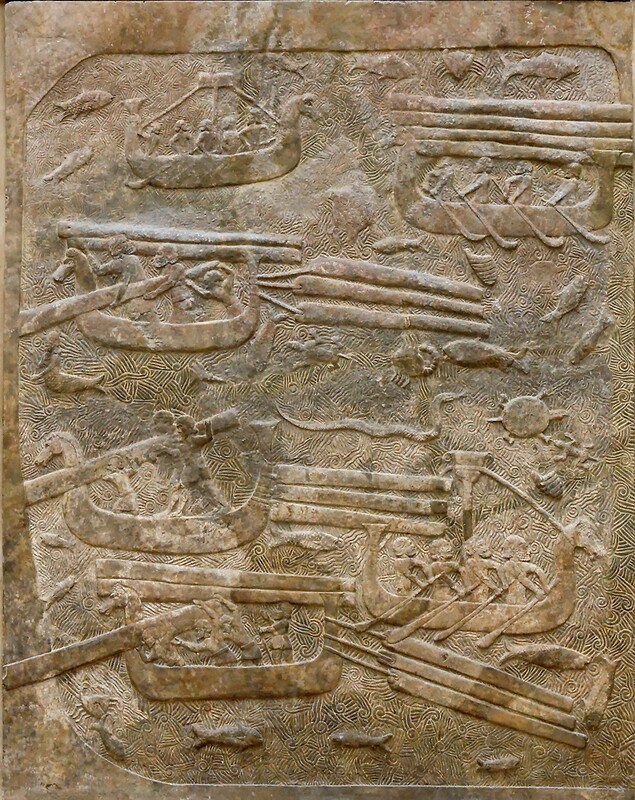 Ramesses III’s war ships are shown on the Medinet Habou relief (ca. 1180 BC) where it can be noted that the lower yard has been removed so that the sail has a lose foot. This development can perhaps be seen as opening the way to the lateen sail concept that will emerge around 1400 years later. After this, Egyptian and Mycenaean seafarers seem to vanish from the scene while Phoenician seafarers appear. 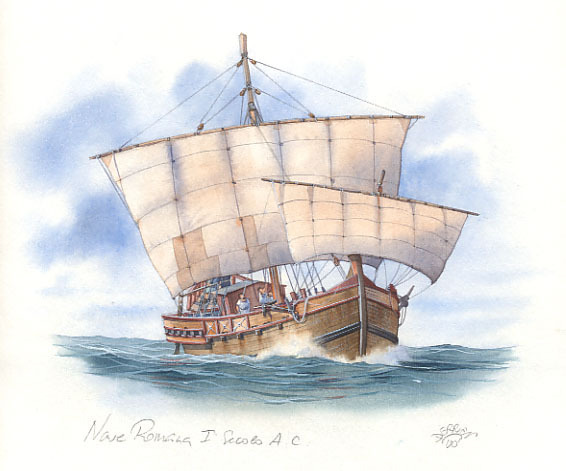 Between 1200 and 600 BC, Phoenicians were involved mainly in (fairly) peaceful maritime trade, sailing all over the Mediterranean Sea and beyond, but very few written or iconographic documents of this period came down to us. In this period, the Egyptian pharaoh Necho II sent an expedition to circumnavigate Africa (ca. 600 BC). Sargon II’s Palace relief showing log transport (ca. 715 BC), found at Dur Sharrukin (Khorsabad in Iraq). This period was followed by the beter known “Greek Classical Period” (500-323 BC), the “Hellenistic Period” (323-31 BC) and the Roman period. 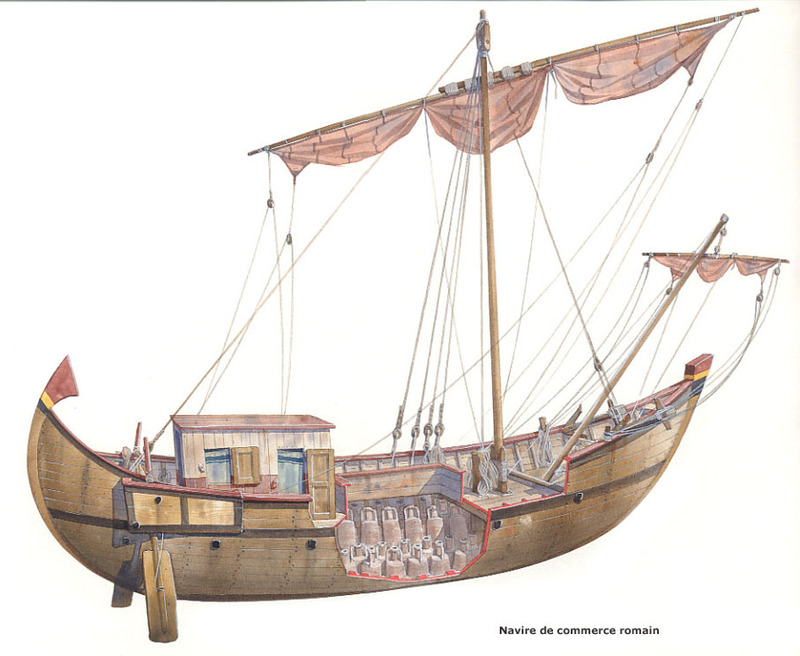 Early large Greek merchant ships of the Kerkouros type with combined rowing and sailing capacity seem to have been in use between 500 BC and 100 BC. They could carry an average of 250 tons of cargo, up to 500 tons. Their average dimensions may have been 3 x 21 m, with 1:7 beam over length ratio, up to 7 x 50 m for the larger ones. 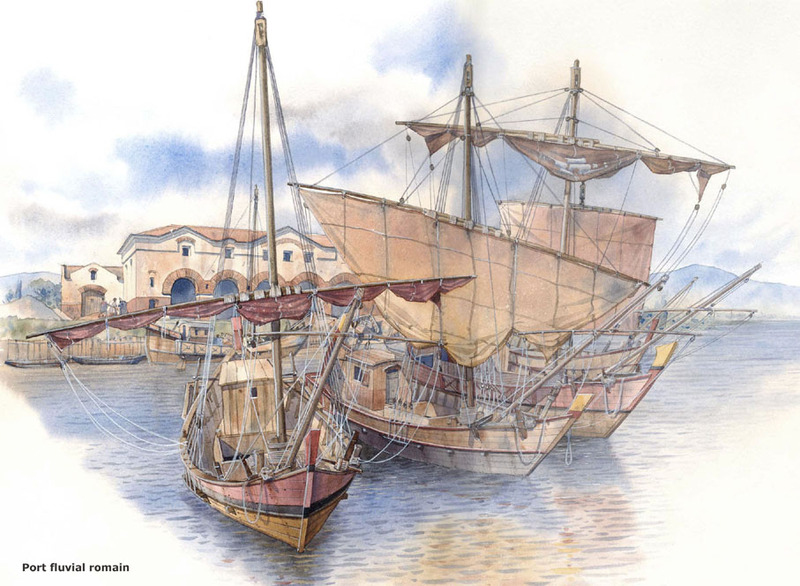 Later ships were more bulky and had no significant rowing capacity anymore, like the Roman Corbita type with 1:4 beam over length ratio. 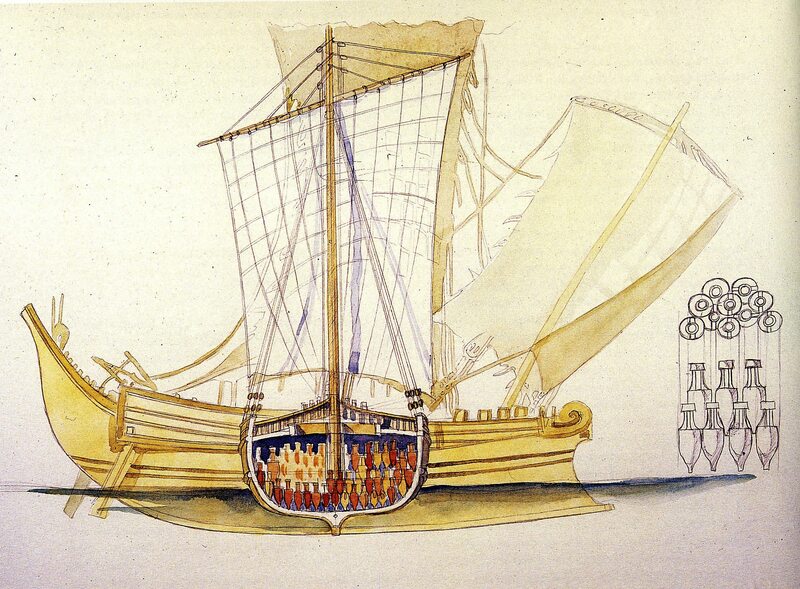 Exceptional ships like the Isis, 14 x 55 m, could carry 1200 tons with around 4.5 m draught, but normal ships ranged between 20 and 50 m for 100 to 500 tons of cargo with up to 3.5 m draught. 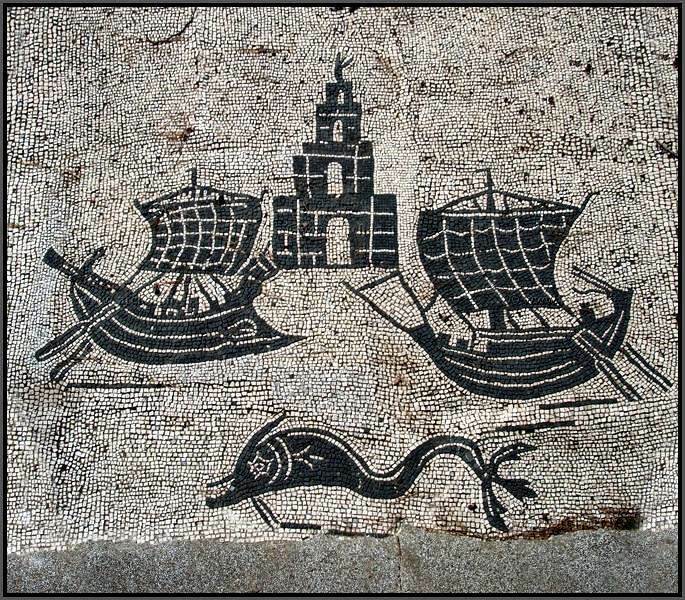 Both concave bows (sharp bulbous bow, also called “cutwater”) and convex (rounded) bows were in use (see Foro delle Corporazioni at Ostia mosaïc below). Most of our knowledge is taken from shipwrecks that tell us about the ships and about their content. The port(s) of origin can often be guessed from the content of the ship, but the port of destination is usually more difficult to identify. It may be said that large ships (and a few smaller ones) were sailing on the long haul between major hubs, but that local redistribution was conducted by small ships only. See hubs and networks for more on this subject. 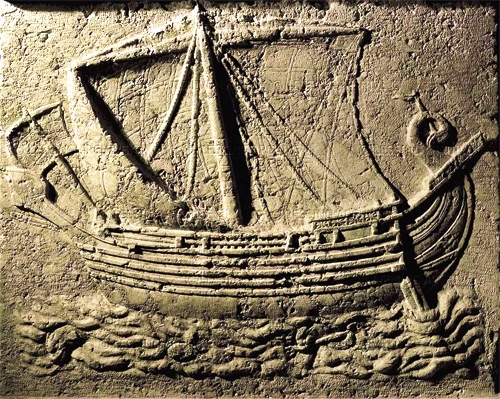 It may be noted also that Kerkouros ships usually docked stern first, while later ships also docked bow first as shown on the Torlonia relief. Alongside docking was required if heavy cargo (live animals, barrels) was to be lifted by cranes. At the end of the Roman Empire (476 AD), it was western Europe that had its “Dark Ages”, for say nine centuries, during which everything had to be rebuilt in the western Mediterranean … while the Arabs were over-active in the Indian Ocean. Many web sites provide further information, e.g. Navis, Navistory, Navigation dans l’Antiquité. 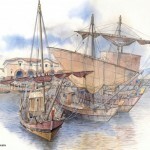 Navire romain (aquarelle de Jean-Marie Gassend) d’après l’épave de la Madrague de Giens (vers 75-60 av. J-C.) avec les amphores disposées en quinconce. Let’s now have a closer look at sailing these ships. Wind force. Sailing was (and still is) considered comfortable with winds of Force 3-4 Beaufort (up to 15 knots), it becomes quite ‘sportive’ with Force 5-6 Bft and critical above Force 7 Bft (over 30 knots). According to Pascal Arnaud (2005, « Les routes de la navigation antique », p 22) : “dans la définition du vent favorable, la force est le critère primordial, et l’orientation un critère secondaire. Un vent est considéré comme praticable dans les petits airs jusqu’au maximum des capacités théoriques de remontée du navire. Dans la brise, il l’est normalement aux seules allures portantes (vent arrière et largue)”, which means that as long as a sea state (wind and waves) does not exceed say Force 4 Bft (15 knots wind), the sailor is free to manoeuvre his ship in various directions, but that for higher sea states he loses this freedom and has to sail downwind. 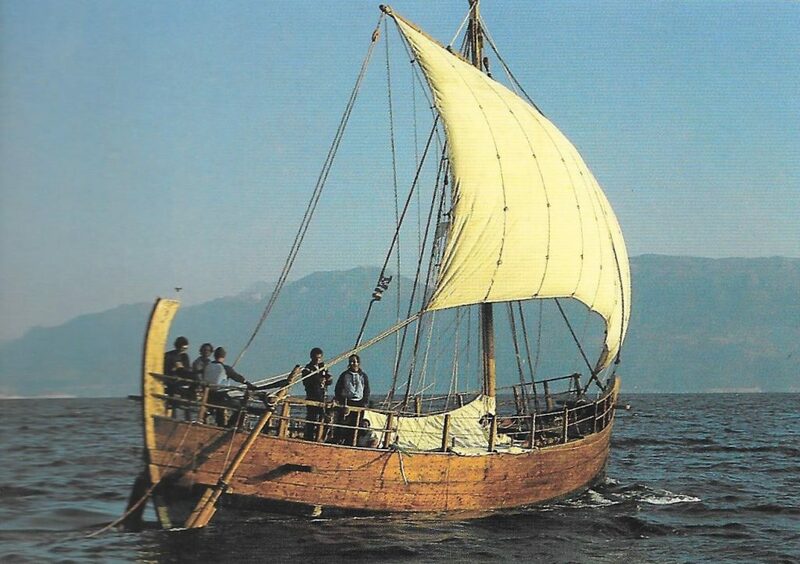 The 1986 Kyrenia II experiment (small 30 ton freighter of 14.5 x 4.5 m) has shown that an ancient merchant ship could resist well in a Force 9-10 Bft storm (45-50 knots wind). Surely much better than any ancient battle ship that would probably not resist more than Force 6 Bft (25 knots wind) and 1 m waves, as shown during the Olympias sea trials (50 ton trireme of 37 x 5.5 m) in 1992 (Morrison, Coates, Rankov, 2000, « The Athenian Trireme »). Wind direction. It was mentioned above that, provided the wind force does not exceed 15 knots, the sailor has some freedom as to his direction of sailing. Ships were normally sailing from wind astern (180°) to wind abeam (90°), but it was possible to sail into the wind up to around 60° (see Arnaud, 2005, and Morrison et al., 2000). 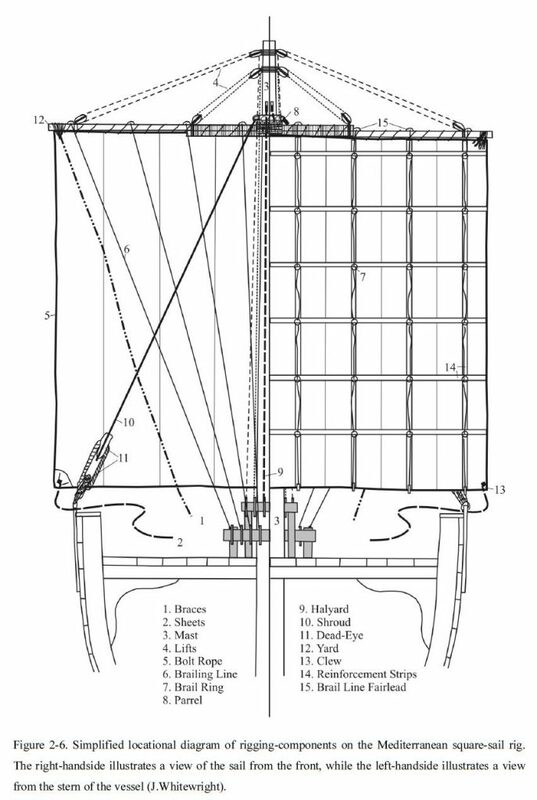 Modern sailing boats may reach 20-30° as shown below, but note that they are designed for racing more than for transporting cargo. 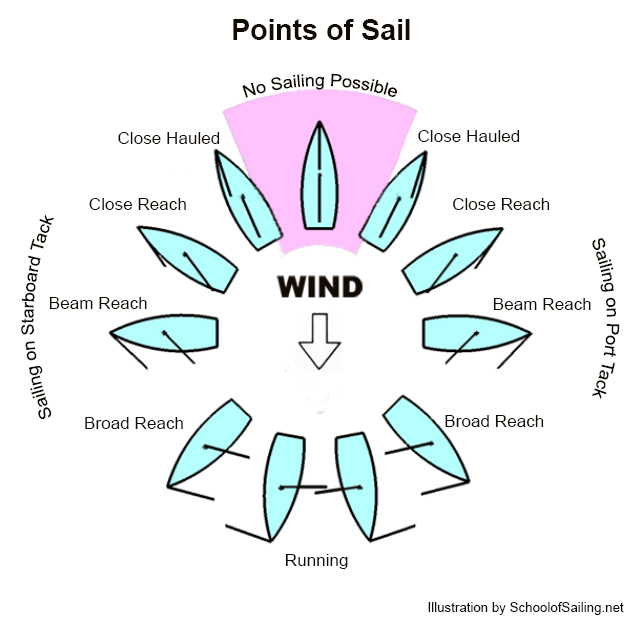 Points of sail of modern sailing boats. 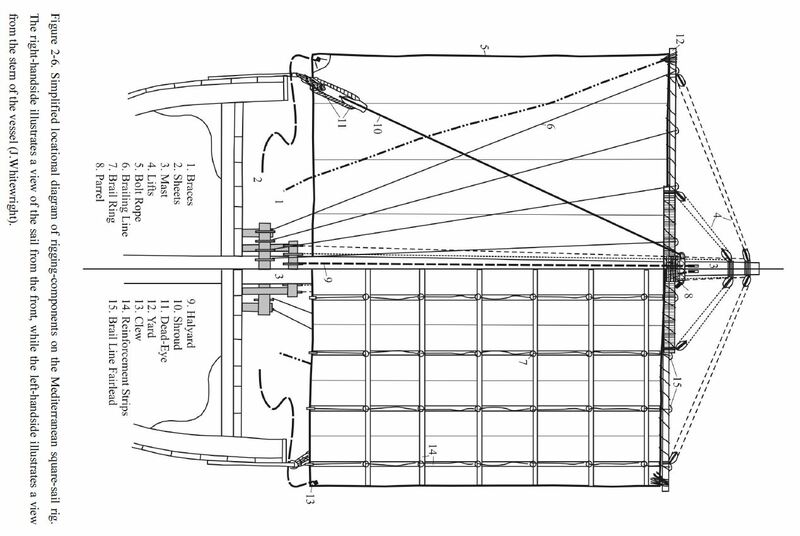 The points of sail shown above are valid for modern ‘Bermuda’ rigs with a large genoa, but ancient ships had square sail(s) or a lateen or settee sail. How about the sailing rigs? 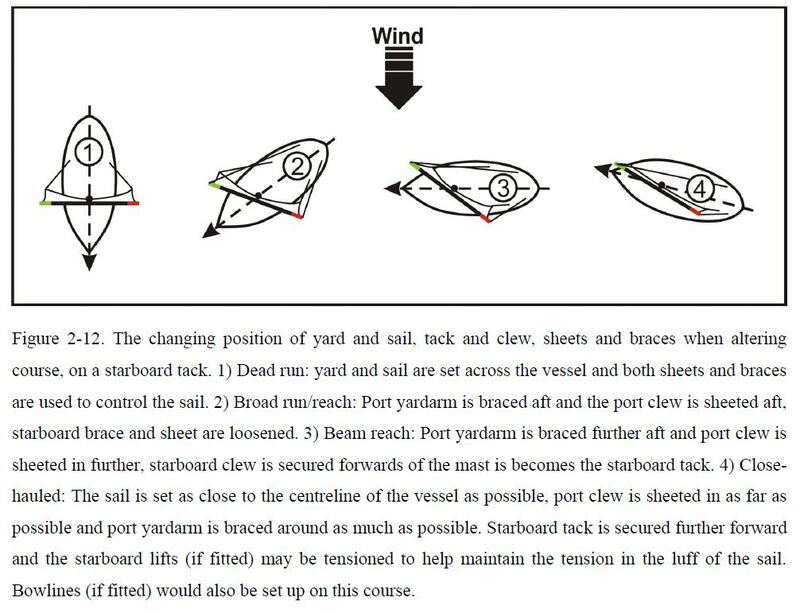 A merchant sailing ship will show the best performance when sailing at broad reach, but it also needs to show acceptable performance in sailing to windward at close reach (see definitions in figure above) with a simple easy-to-build sailing rig. The lateen/settee rig was probably invented in the 2nd c. AD and was widely adopted in the 5th c. AD. This does not mean that square sails were abandoned, as they were still in use on windjammers at the end of merchant sailing in the early 20th c.. Several concepts thus coexisted over very long periods of time (Julian Whitewright, Pascal Arnaud, Rod Heikell ). The various sailing rigs obviously had pros and cons and mariners made their own choices. 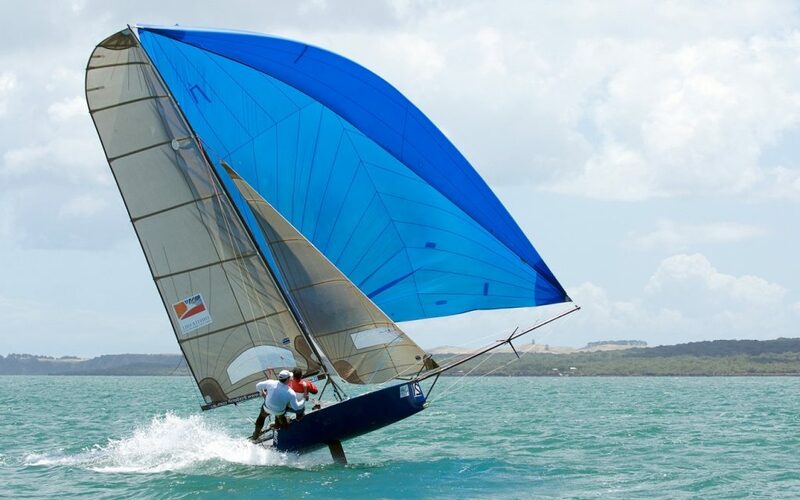 Note that modern sailors are biased by the modern triangular Bermuda rig designed for sailing-boat racing in the 19th c.. Hence, we must question the idea that square sails cannot sail to windward (close reach). Kyrenia II sailing at beam reach on the Aegean Sea in 1987. Modern sailing boat under spinnaker at beam reach … rather sporty! From a sailors’ point of view, it was worth trying to take the end of the upper yard of the square sail down to the bow to reduce the length of sail-cloth prone to sagging on the luff side. This would probably leave too much sail abaft the mast so that the ship would easily luff, but it opened the way to the triangular shape of the lateen/settee rig pointing into the wind. 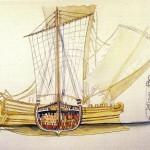 Furthermore, the lateen sail consisted of less components than the square sail, but it required more crew to be handled. Whitewright (2011) shows that the lateen and settee rigs performed only very slightly better to windward than square sails as it allowed sailing 55 to 65° off the wind direction, while a square sail would allow 60 to 65°. The ‘speed made good’ (rectilinear speed resulting from the much longer distance sailed while tacking) was only 1 to 2 knots in both cases (with moderate wind and calm sea). Hence, there is very little difference in the overall performance of both rigs and this explains why both coexisted for many centuries. 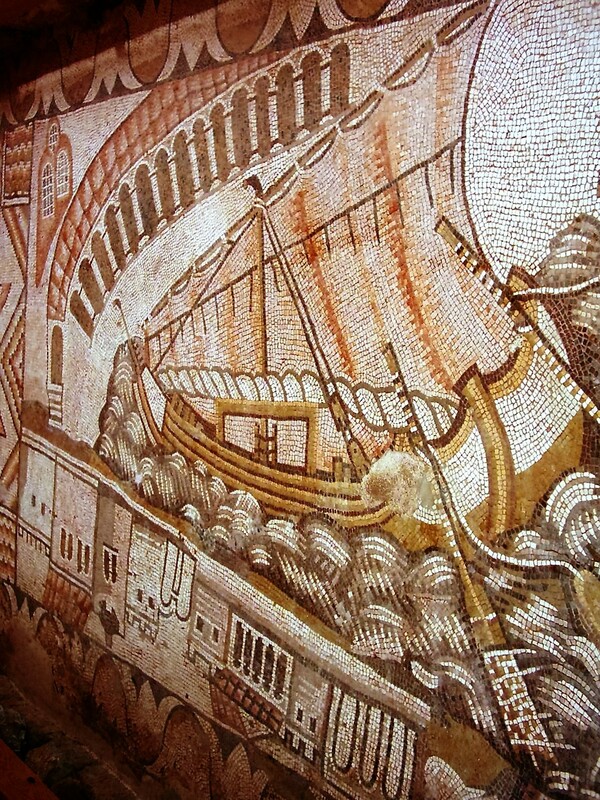 The 5th century Kelenderis mosaic below shows a ship in full action in a rough sea. 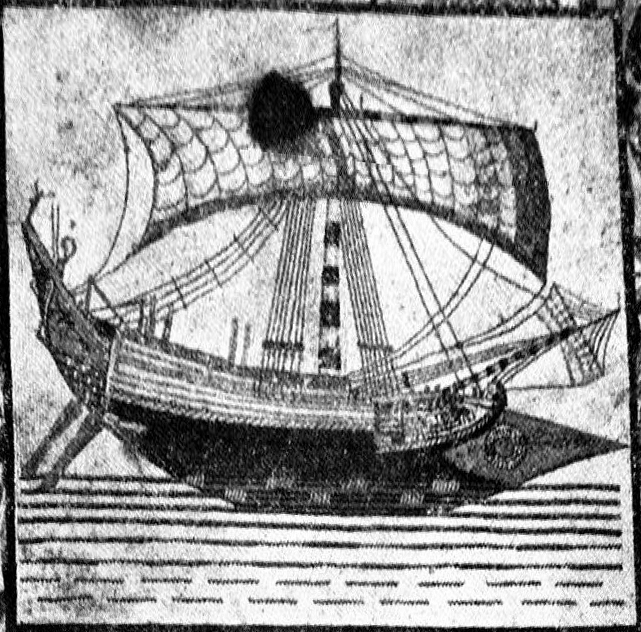 Kelenderis 5th c. AD mosaic discovered by Levent Zoroglu in 1992, showing a ship with reefed trapezoidal sail close to a lateen rig. 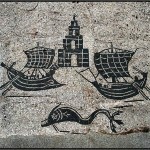 Note that although the harbour city is depicted, the ship is sailing in rough seas with many waves. In this picture, you can almost feel the rough sailing conditions at close reach with a reefed sail. Such a picture of a sailing ship in full action is very rare as artists never had an opportunity to see this from the shore. 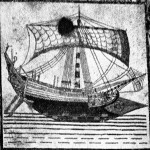 Sailors are not conservative at all when it comes to sail settings and they may very well have used the triangular setting of the square sail for many centuries before the Kelenderis mosaic picture. The main sailing routes have been deduced from ancient texts (Arnaud, 2005) and from modern ‘Pilots’ used by yachtsmen. Indeed, the meteorological sailing conditions are considered to be fairly unchanged over the past few millennia. Wind speed and direction are of paramount importance for sailing, as Mediterranean currents play a secondary role and high waves are avoided as much as possible. The prevailing wind direction almost everywhere on the Mediterranean Sea is NW. Note that ‘prevailing’ usually means ‘over 50% of time’, but not 100%! In addition, a constant wind direction is required for long-haul offshore sailing. This is typically the case from Sicily to Alexandria in summer time, but other prevailing wind directions may exist locally, e.g. North on the Aegean Sea, North and NE on the Black Sea and East along the coasts of Algeria. Obviously, some finer analysis is needed to find a way back to Rome from Alexandria. This trip is achieved by using sea breezes blowing in the afternoon from the sea to the land. These winds are best felt within a few miles off the coast. They blow more or less perpendicular to the coast, but may locally reach an angle of 45° or even be parallel to the coast. Going East can be achieved by long-haul offshore sailing, and going West has to be done by coastal navigation. The trip to Rome is therefore much longer than the trip to Alexandria as it is not only longer in distance, but it also involves much waiting for favourable wind conditions. The trip from Alexandria to Rome goes North along the Levantine coast, then West along the southern Cypriot coast (although lucky sailors would make a direct route to Cyprus using the westerlies). From Cyprus to Rhodes is very difficult due to adverse winds. The Aegean Sea is famous for its northern wind called Meltemi which makes its East-West crossing a subtle operation using local winds around the islands. The route through the Aegean Sea is still a matter of debate, some favour the northern route, but those not going to Athens prefer the southern route avoiding the dangerous Cape Maleas. West of the Peloponnesus, the Ionian Sea with prevailing NW winds has to be crossed, probably by following the Greek coast before crossing over to Calabria and to the Messina Strait. An alternative to this Aegean route is the Libyan route along the coasts of Cyrenaica, Libya and Tunisia (mainly in May and in October, in order to avoid the northwestern “etesian winds”). The Western Mediterranean is subjected to low pressures travelling from West to East and inducing a counter-clockwise wind pattern. Hence, on the French South coast, the wind will blow from South to East first, then turn to North to NW, generating the famous Mistral and Tramontana. This explains that it can be difficult to sail from Marseille to Cabo de Creus and that this has to be done close to the coast to avoid high offshore waves induced by the Tramontana. The trip back may lead through the Baleares and Sardinia, where the westerlies will prevail, then along the western coasts of Sardinia and Corsica where a southern wind may blow. Those going to Rome will take the dangerous Straits of Bonifacio between Sardinia and Corsica. The coast of North Africa is prone to summer easterlies between Cap Bon and Oran, but lack of wind between Oran and Gibraltar … in addition to adverse east going surface currents of Atlantic water compensating the Mediterranean evaporation. The Tunisian Golfe de Gabes and Libyan Gulf of Syrt have a tidal range up to 1 m inducing tidal currents that can be used by sailors in both directions. The summer winds may blow from North to East. The access to the Black Sea is very difficult because of the strong southward surface current of fresh water flowing towards the Mediterranean Sea, in addition to NE winds. Inside the Black Sea, currents flow counter-clockwise and favour a trip to the East along the Turkish coast, before crossing over to Crimea against prevailing winds. Nevertheless, ancient seafarers are known to have sailed massively along the western Black Sea coast to Crimea and to the Azov Sea, possibly because this trip was free of pirates. The need for a large number of shelters follows from the fact that sailors may need to wait for proper wind conditions or may try to escape bad weather conditions. Even though they can sail 50 to 100 nautical miles in a day (see Ancient Measures), it is important to know where they can find a safe shelter within two to three hours of navigation, i.e. only approx. 10 miles. It has hopefully been made clear in this (very) brief survey of Mediterranean sailing that it is a vast and complicated subject that requires a lot of experience. History shows that Mycenaeans (ca. 1500-1200 BC), Phoenicians (ca 1200-150 BC) and Greeks (ca. 800-300 BC) were very good at that. Mycenaean sailors had a very difficult playground in the Aegean Sea. Perhaps their experience was later taken over by Phoenicians who used it to travel all over the Mediterranean Sea and beyond. Much discussion has taken place concerning the route when sailing back from the Indian coast, the Somalian and the Yemenite coasts. The southern part of the Red Sea is subject to reversing monsoon winds and sailors could make use of that. However, North of 20° of latitude the northern winds blow all year round on the Red Sea, making the trip back to the North quite uneasy. Some merchants therefore had their ships calling at ports like Berenike (near Ras Banas) and Myos Hormos (Quseir al-Qadim) in order to continue the journey by land via Coptos (Qift) and the Nile down to Memphis (Cairo) and Alexandria. Other merchants decided to call at Leuke Kome (possibly Sharm al-Wajh in Saudi Arabia, acc. to Nehmé (2014)) and further by land to Petra and Gaza. These routes were an alternative to sailing to Clysma (Suez) with continuous northerlies, or to Charax Spasinou (Jebel Khayabir, about 50 km North of Basra), via the Gulf, in order to reach the Mediterranean coast near Palmyra, but with lots of NW winds also. Cooper (2011)  shows that both routes had pros and cons. The journey time from Berenike to Memphis was quite similar for both routes (at best around 3-4 weeks). Both routes induced a number of risks (grounding at sea and on the Nile, pirates at sea and on land, etc.). Sidebotham (1989) suggested that bulky agricultural cargoes might have travelled through Clysma, while more luxury cargoes might have taken the land route and the Nile. The final answer may not yet be given but the sketch below will provide a summary of the physical conditions and approximate journey times. Physical conditions and journey times on the Red Sea and on the Nile. Physical conditions concern current and wind. 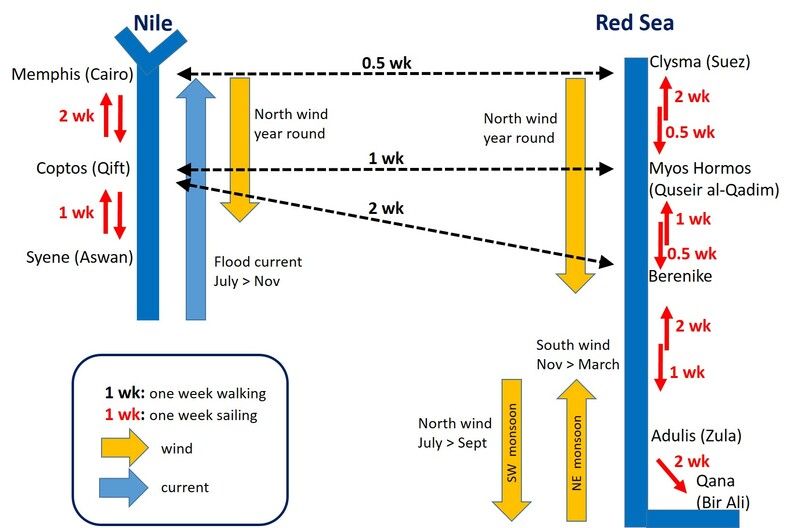 Schematically, the current in the Nile varies between 1 knot (ca 2 km/h) in the low water season (December to June) and 3 knots (ca 6 km/h) at the peak of the flood season (September). The wind is blowing from North, against the current, most of the time in the Nile valley (note that the Nile delta is subject to seasonal variations with its famous summer northerlies). The Red Sea is subjected to a similar wind regime in its northern part (say North of Port Sudan at 20° latitude) and the Red Sea Pilot states that “you should not count on any South winds from Ras Banas northwards” (at 24° latitude). The southern Red Sea has seasonal variations due to the monsoon regime and winds can be strong in the Straits of Bab el-Mandeb. Journey times for shipping are shown northbound and southbound. These are of course approximate times without stops at ports. Southbound on The Red Sea is pretty fast with around 50 to 80 nautical miles per day (i.e. 4 to 6.5 knots assuming 12 hours/day sailing time). Northbound on the Red Sea is very slow as sailing is not possible in a straight line and no more than 20 to 25 nautical miles/day can be done (i.e. less than 2 knots assuming 12 hours/day sailing time). These values are confirmed by Pascal Arnaud (2005) who is a Roman historian and a sailor himself . Journey times on land between the Red Sea ports and the Nile are provided also. ARNAUD, P., (2005), “Les routes de la navigation antique”, éd. Errance. ARNAUD, P., (2014), “Marseille grecque et les routes du commerce maritime”, in “Les territoires de Marseille antique”, Arles, Paris, éd. Errance, p 185-213. TAMMUZ, O., (2005), “Mare clausum? Sailing Seasons in the Mediterranean in Early Antiquity”, Mediterranean Historical Review, Vol 20, No. 2, December 2005, pp. 145-162. MORRISON, J.S. ; COATES, J.F. 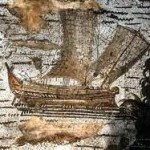 ; RANKOV, N.B., (2000), “The Athenian Trireme”, Cambridge University Press. Sea breezes blow from sea to shore in the afternoon, easing the arrival to harbours. Land breezes blow during the night and early morning easing departure from the harbour. “1. The relatively high temperatures of the Mediterranean mean that sea breezes are not the gentle zephyrs encountered in more temperate climes. In many places, the temperature differences generate winds up to Force 5–6 and can reach up to 50 miles off the coast. 2. There is a fairly accurate wind clock for the sea breeze. As the land warms up in the morning the sea breeze will begin to blow at 1100–1200 local time at around Force 2–3. Usually within an hour the wind will get up to Force 4–6 and will blow through the afternoon until early evening. The wind will die off fairly quickly around 1900–2000 local time. The abruptness of the change is linked to the air temperatures and geography of a region. In general, the higher the temperature, the more abrupt the transition between morning calm and the onset of the full force of the sea breeze. The terrain affects the sea breeze according to altitude: low-lying plains or gentle S-facing slopes will heat up more quickly than mountain ranges with valleys in shadow for much of the day and so generate greater pressure differences and stronger winds. It may be added here that coastal effects modify the wind direction and strength, e.g. around a headland with high land where the wind will follow the shore and curve around the headland with an increased speed. 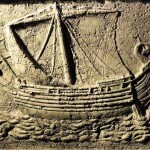 COOPER, J.P., (2011), “No easy option: Nile versus Red Sea in ancient and medieval north-south navigation”. In W.V. 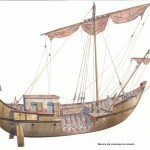 Harris & K. Iara (eds), Maritime Technology in the Ancient Economy: Ship Design and Navigation. Journal of Roman Archaeology Supplementary Series 84: 189–210. HEIKELL, R., (2015) “Sailing Ancient Seas”, Taniwha Press, UK. 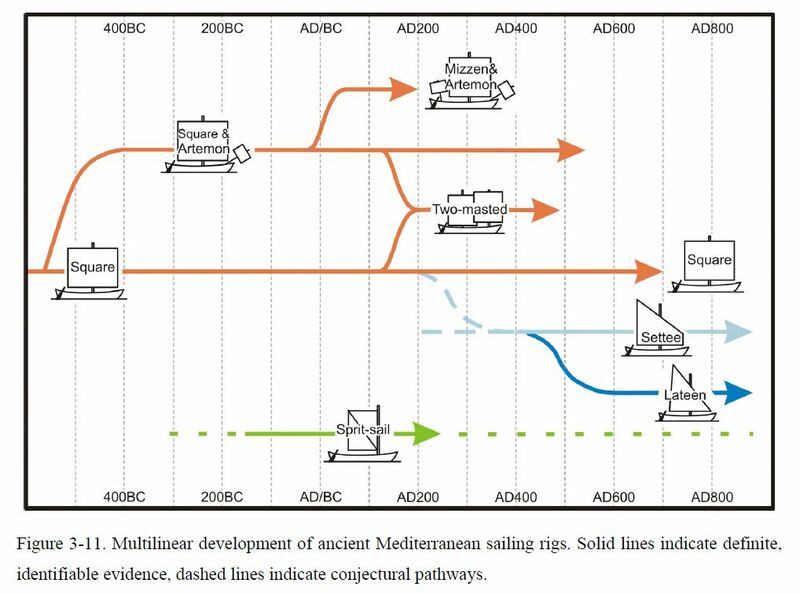 WHITEWRIGHT, J., (2011), “The Potential Performance of Ancient Mediterranean Sailing Rigs”, The International Journal of Nautical Archaeology (2011), 40.1: 2–17. See also his 2008 PhD thesis at Southampton University. POMEY, P., (2006), “The Kelenderis Ship: A Lateen Sail”, The International Journal of Nautical Archaeology, 2006, 35.2, pp 326-335. TALLET, P. & LAISNEY, D., (2012), “Iry-Hor et Narmer au Sud-Sinaï (Ouadi ‘Ameyra) – Un complément à la chronologie des expéditions minières égyptiennes”, Bulletin de l’Institut Français d’Archéologie Orientale, Tome 112, Le Caire, 2012, pp 381-398. BOETTO, G., (2012), “Les épaves comme sources pour l’étude de la navigation et des routes commerciales: une approche méthodologique”, in: Rome, Portus and the Mediterranean, edt. S. Keay, British School at Rome, Oxbow Books. POMEY, P., (2015), « Navires et construction navale dans l’Égypte ancienne », in Entre Nil et mers, la navigation en Egypte ancienne », edt B. Argémi & P. Tallet, Actes des rencontres de Provence Égyptologie, Musée Départemental Arles Antique, le 12 avril 2014. POMEY, P., (2006), « Le rôle du dessin dans la conception des navires antiques. À propos de deux textes akkadiens », in L’Apport de l’Égypte à l’histoire des techniques. Edt B. Mathieu, D. Meeks, M. Wissa, Méthodes, chronnologie et comparaisons, BdE 142, Cairo. See also discussion Pomey, 2009 and Bash, 2009. EMANUEL, J., (2014), « Sea Peoples, Egypt, and the Aegean: The Transference of Maritime Technology in the Late Bronze–Early Iron Transition (LH III B–C) », Aegean Studies, No. 1, 2014, pp 21-56, online publication December 1, 2014. VAN ALFEN, P., (2015), « Phoenician Trade: An Overview », Working Paper v.31.3.2015. VIRGIL (Eneid, 5, 8-25) explains what any sailor would still do today with unfavourable winds, i.e. 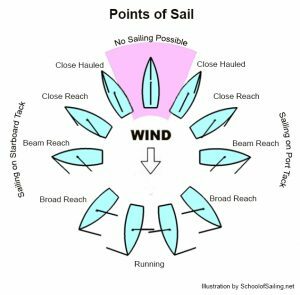 try tacking, but bear away to downwind if the wind is too strong. ARISTOTLE (Mechanica, 851-b) already pointed this out, see Pomey, P., (1997), “La Navigation dans l’Antiquité”, p 80-82. Marcus, E., 2002, “Early Seafaring and Maritime Activity in the Southern Levant from Prehistory through the Third Millenium BCE”, in van den Brink & Levy eds, Egypt and the Levant, interrelations from the 4th through the Early 3rd millenium BCE, New approaches to Anthropological Archaeology, pp 403-417. Potts, D., 2016, “Cultural, economic and political relations between Mesopotamia, the Gulf region and India before Alexander”, in Megasthenes and His Time, Harrassowitz Verlag, Wiesbaden, pp 109-118. For a superb overview of the Roman history, have a look at: Badel, C. & Inglebert, H., 2014, “Grand Atlas de l’Antiquité romaine – Construction, apogée et fin d’un empire”, éd. Autrement, Paris, (191 p).